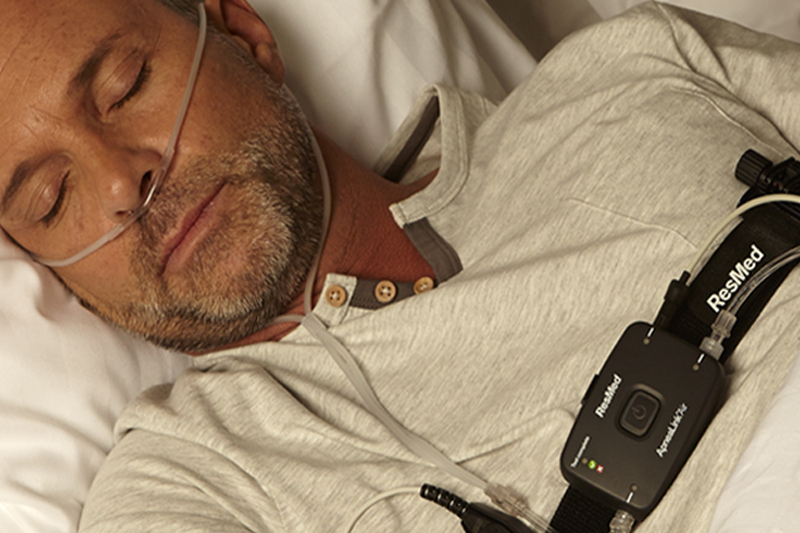 Our office uses ResMed Apnea Link Air and Plus Home Sleep Testing devices to detect the diagnosis of sleep related breathing disorders. This monitors respiratory disturbances, nasal airflow, snoring and blood oxygen saturations. Home sleep testing is done for one night only, unless a clinician has recommended differently. The decision to pursue a Home Sleep Test (HST) as opposed to an in-lab Polysomnogram (PSG) will be made after review of your symptoms and medical history with a provider. If your test is negative for sleep apnea and there are still significant concerns that you may have sleep apnea, your provider may recommend an in-lab Polysomnogram for further evaluation. If the light changes from GREEN to RED, this typically indicates a piece of equipment has come loose. Please check the placement of the following items and adjust them until the light turns back to green. If the light switches to RED and this cannot be resolved, in most instances the test will need to be repeated. Please bring the device back to the office and we can analyze the data and let you know if it needs to be repeated. If the batteries are depleted, please replace the batteries. ResMed ApneaLink Air (Gray device) – 2 AAA batteries.